We thoroughly enjoyed our stay in the Manolis Studios. The weather was excellent; hot sun with a lovely cool breeze. The location was on the edge of the resort, very close to a local supermarket and bars and restaurants. Also at extremley reasonable prices- we were definatley spoilt for choice. The closest beach was around a 10 minute walking distance from the studios. Bambis, Maria and family were the perfect hosts, friendly and helpful and the meals and snacks they cooked were all delicious and were extremley reasonably priced. The pool was lovely, big and clean with a small baby pool at the edge. There were plenty of sunbeds around the pool but it was not crowded and there was always enough room to feel comfortable. Some rooms overlooked the snack bar and pool whereas others faced different areas. We had two rooms on the ground floor which we found lovely. The rooms were basic- a small kitchenette with a fridge, small cooker, sink, cupboards etc. Joint on to this was a bedroom with a wardrobe, three beds and we had a dressing table with a mirror. The bathroom had a sink, mirror, toilet and stand up shower. We thought the rooms were lovely and were very happy with them. We definatley want to stay at Manolis studios again as we spent a lovely holiday there! Just returned from our 3rd visit to the Manolis studios and will no doubt be back again! 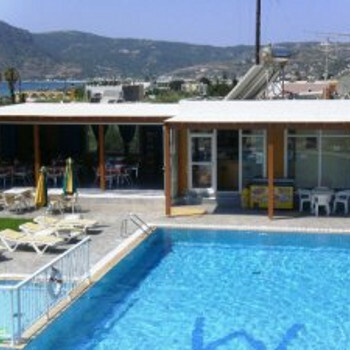 Clean apartments, excellent snack bar and lovely pool with loads of sunbeds. The Manolis family are friendly and Bambis is quick to correct your Greek pronunciation - and teach you more! The location is on the edge of the resort but within easy walking distance of all bars, restaurants & shoss. Only a five minute walk to the beach too. the manolis studios were basic but catered to all our needs.bit disappointing that the toilet bin was only changed once while we were there.the food in the bar was excellent and plenty of choice available.the location at first looked like it was far away from everthing but it was quite a pleasant stroll to get to bars and restarants.excellent location for the beach and supermarkets.friendly family but didnt get to know them really as we were out a lot of the time.if we went to kos again we would stay here and definately recommend it to anyone else. Had a lovely time at the Manolis studios. We found the studios to be in a good location if you want a relaxing holiday. It is quite a walk down the road to the main bars and restaurants. The Manolis family were very nice and the pool very good the snack bar did excellent burgers and club sandwiches. The rooms are ample, although we were a bit dissapointed with the cleaning of the rooms, we arrived Wednesday and the only time a maid came in was Sunday, where we had clean bedding and towels room cleaned and the bins emptied. (yes even the toilet bin was only emptied once whilst we were there.) We were also very surprised to find that we had to provide our own loo paper. Be warned no aircon and it was hitting 45 degrees whilst we were there. Room 14 is lovely overlooking the pool. Manolis Studios are situated on the airport end of kamari bay (Kefalos). The rooms are simple but spacious and very very clean with new towels and sheets twice a week. The studios are run by Manolis's adult children who are very friendly and accomodating. The pool area is very nice, clean and never crowded, and not overlooked. There is a small paddling pool for the kids too. the snack bar will cater for your every need if you don't fancy leaving the studios but jims supermarket and Savvas restaurant 100 yards away are both excellent and good value. The studios have safe deposit boxes and fans to rent by the week. The studios are about a 20 minute stroll along the beach or the road from the harbour but their are numerous restaurants, bars shops and hire places along the road. 8 of us formed our holiday group. We stayed at the Manolis Studios. They were very clean, towels and bedding changed twice a week. These studios are run by a family, who cater for your every need. They cannot do enough for you. They try and teach you a little greek, when you order anything!! It was no trouble for them to cook you a snack at anytime. The pool area was hosed down regularly, and the pool kept very clean. There was no entertainment as such, but a large screen T.V. was in the bar area, with satelite programmes. We have already booked for next year! !